A publication explaining how protected forests are crucial to sustainable drinking water supplies for world's biggest cities. Over the past 100 years, the world population has grown three times. With the rise in population, the number of cities has also increased from 43 cities in 1900 to around 800 cities in 1990. On the one hand, the demands of these developments are creating increasing pressure on many governments to justify the continued protection of forest areas, since alternative uses of lands usually promise higher economic benefits. On the other, the same developments are responsible for shortage of regular supply of drinking water. There is a link between supply of high quality drinking water and forest protected areas. Many of the world's cities rely on protected forests for some or all of their water supply requirements. 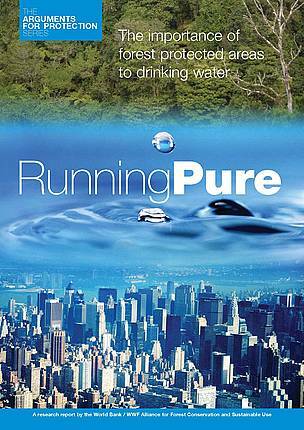 Running Pure is a research report sponsored by the World Bank/WWF Alliance for Forest Conservation and Sustainable Use. Till recently, biodiversity was the central value in the arguments for protected areas. This report seeks to develop wider arguments for protection, focusing on the potential role of protected areas in helping to maintain water supply to major cities. The report includes a study of world's top 105 cities (25 each from Africa, Americas, Asia, Europe, and 5 from Australia) demonstrating the global importance of forests to urban water supplies. A summary of the findings from the study is provided below. The report offers information on the cities that rely on protected areas for their drinking water supply and the measures some of them have taken for sustainable provision of their water supply requirements. Written by Professor Lawrence S Hamilton and David Cassells, this essay explains the role of forests in watersheds and catchments, the type of forests most suitable for regular water supply to urban areas, and the conditions in which these forests can help in preventing erosion, sedimentation and floods. In this essay, Stefano Pagiola (Senior Environmental Economist, World Bank), makes a case for payment for watershed services through Payment of Environment Services schemes. The essay gives an economic overview that covers the logical basis for such payments, what is required to arrive at valuations of watershed services, the actors involved and what they need to consider for making such payment systems successful. Designation of lands and waterways for urban watershed protection can have widely varying impacts on different groups because the livelihoods and welfare of low-income groups in developing countries are especially sensitive to access to water, forest and land. This essay, by Sara J. Scherr (Director, Ecosystem Services, Forest Trends), focuses on potential social implications of protecting and managing forests for water supply on such groups.